The Green Revolution has been a failure. It has led to reduced genetic diversity, increased vulnerability to pests, soil erosion, water shortages, reduced soil fertility, micronutrient deficiencies, soil contamination, reduced availability of nutritious food crops for the local population, the displacement of vast numbers of small farmers from their land, rural impoverishment and increased tensions and conflicts. The beneficiaries have been the agrochemical industry, large petrochemical companies, manufacturers of agricultural machinery, dam builders and large landowners. The "miracle" seeds of the Green Revolution have become mechanisms for breeding new pests and creating new diseases. In 1970, Norman Borlaug was awarded the Nobel Peace Prize for his work in developing high-yielding varieties (HYVs) of wheat. 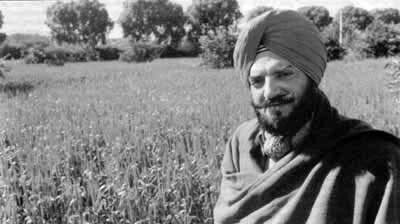 The "Green Revolution", launched by Borlaug's "miracle seeds", is often credited with having transformed India from "a begging bowl to a bread basket", and the Punjab is frequently cited as the Green Revolution's most celebrated success story. Yet, far from bringing prosperity, two decades of the Green Revolution have left the Punjab riddled with discontent and violence. Instead of abundance, the Punjab is beset with diseased soils, pest-infested crops, waterlogged deserts and indebted and discontented farmers. Instead of peace, the Punjab has inherited conflict and violence. It has often been argued that the Green Revolution provided the only way in which India (and, indeed, the rest of the Third World) could have increased food availability. Yet, until the 1960s, India was successfully pursuing an agricultural development policy based on strengthening the ecological base of agriculture and the self-reliance of peasants. Land reform was viewed as a political necessity and, following independence, most states initiated measures to secure tenure for tenant cultivators, to fix reasonable rents and to abolish the zamindari (landlord) system. Ceilings on land holdings were also introduced. In 1951, at a seminar organized by the Ministry of Agriculture, a detailed farming strategy—the "land transformation" programme — was put forward. The strategy recognized the need to plan from the bottom, to consider every individual village and sometimes every individual field. The programme achieved major successes. Indeed, the rate of growth of total crop production was higher during this period than in the years following the introduction of the Green Revolution. However, while Indian scientists and policy makers were working out self-reliant and ecologically sound alternatives for the regeneration of agriculture in India, another vision of agricultural development was taking shape within the international aid agencies and large US foundations. Alarmed by growing peasant unrest in the newly independent countries of Asia, agencies like the World Bank, the Rockefeller and Ford Foundations, the US Agency for International Development and others looked towards the intensification of agriculture as a means of 'stabilizing' the countryside - and in particular of defusing the call for a wider redistribution of land and other resources. Above all, the US wished to avoid other Asian countries' following in the revolutionary footsteps of China. 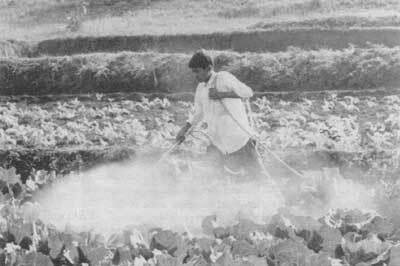 In 1961, the Ford Foundation thus launched its Intensive Agricultural Development Programme in India, intended to "release" Indian agriculture from "the shackles of the past" through the introduction of modern intensive chemical farming. Adding to the perceived geopolitical need to intensify agriculture was pressure from western agrochemical companies anxious to ensure higher fertilizer consumption overseas. Since the early 1950s, the Ford Foundation had been pushing for increased fertilizer use by Indian farmers, as had the World Bank and USAID - with some success. Whilst the government's First Five Year Plan viewed artificial fertilizers as supplementary to organic manures, the second and subsequent plans gave a direct and crucial role to fertilizers. But native varieties of wheat tend to "lodge", or fall over, when subject to intensive fertilizer applications. The new ‘dwarf' varieties developed by Borlaug, however, were specifically designed to overcome this problem: shorter and stiffer stemmed, they could absorb chemical fertilizer, to which they were highly receptive, without lodging. By the mid 1960s, India's agricultural policies were geared to pushing the introduction of the new "miracle" seeds developed by Borlaug. The programme came to be known as the New Agricultural Strategy. It concentrated on one-tenth of the arable land, and initially on only one crop — wheat. By 1968, nearly half the wheat planted came from Borlaug's dwarf varieties. A host of new institutions were established to provide the research required to develop further the Green Revolution, to disseminate the seeds, and to educate people in the appropriate agricultural techniques. By 1969, the Rockefeller Foundation, in co-operation with the Ford Foundation, had established the Centro International de Agriculture Tropical (CIAT) in Colombia and the International Institute for Tropical Agriculture (IITA) in Nigeria. In 1971, at the initiative of Robert McNamara, the President of the World Bank, the Consultative Group on International Agricultural Research (CGIAR) was formed to finance the growing network of international agricultural centres (IARCs). Since 1971, nine more IARCs have been added to the CGIAR system. Over the last two decades, FAO has played a key role in promoting the Green Revolution package of "improved" seeds, agrochemicals and irrigation schemes. The term "high-yielding varieties" is a misnomer, because it implies that the new seeds are high yielding of themselves. The distinguishing feature of the seeds, however, is that they are highly responsive to certain key inputs such as fertilizers and irrigation water. The term "high responsive varieties" is thus more appropriate. In the absence of additional inputs of fertilizers and water, the new seeds perform worse than indigenous varieties. The gain in output is insignificant compared to the increase in inputs. The measurement of output is also biased by restricting it to the marketable elements of crops. But, in a country like India, crops have traditionally been bred to produce not just food for humans, but fodder for animals and organic fertilizer for soils. In the breeding strategy for the Green Revolution, multiple uses of plant biomass seem to have been consciously sacrificed for a single use. An increase in the marketable output of grain has been achieved at the cost of a decrease in the biomass available for animals and soils from, for example, stems and leaves, and a decrease in ecosystem productivity due to the over-use of resources. Significantly, much of the increased yield obtained by planting the new HYV varieties consists of water. Increasing the nitrogen uptake of plants through using artificial fertilizers upsets their carbon/ nitrogen balance, causing metabolic problems to which the plant reacts primarily by taking up extra water. Diversity is a central principle of traditional agriculture in the Punjab, as in the rest of India. Such diversity contributed to ecological stability, and hence to ecosystem productivity. The lower the diversity in an ecosystem, the higher its vulnerability to pests and disease. The Green Revolution package has reduced genetic diversity at two levels. First, it replaced mixtures and rotations of crops like wheat, maize, millets, pulses and oil seeds with monocultures of wheat and rice. Second, the introduced wheat and rice varieties came from a very narrow genetic base. Of the thousands of dwarf varieties bred by Borlaug, only three were eventually used in the Green Revolution. On this narrow and alien genetic base the food supplies of millions are precariously perched. Because of their narrow genetic base, HYVs are inherently vulnerable to major pests and diseases. As the Central Rice Research Institute, in Cuttack, India, notes of rice: "The introduction of high yielding varieties has brought about a marked change in the status of insect pests like gall midge, brown planthopper, leaf-folder, whore maggot, etc. Most of the high-yielding varieties released so far are susceptible to major pests with a crop loss of 30-100 per cent. "3 Even where new varieties are specially bred for resistance to disease, "breakdown in resistance can occur rapidly and in some instances replacement varieties may be required every three years or so. "4 In the Punjab, the rice variety PR 106, which currently accounts for 80 per cent of the area under rice cultivation, was considered resistant to whitebacked planthopper and stem rot when it was introduced in 1976. It has since become susceptible to both diseases, in addition to succumbing to rice leaf-folder, hispa, stemborer and several other insect pests. The natural vulnerability of HYVs to pests has been exacerbated by other aspects of the Green Revolution package. Large-scale monoculture provides a large and often permanent niche for pests, turning minor diseases into epidemics; in addition, fertilizers have been found to lower plants' resistance to pests. The result has been a massive increase in the use of pesticides, in itself creating still further pest problems due to the emergence of pesticide-resistant pests and a reduction in the natural checks on pest populations. The "miracle" seeds of the Green Revolution have thus become mechanisms for breeding new pests and creating new diseases. Yet the costs of pesticides or of breeding new "resistant" varieties was never counted as part of the "miracle" of the new seeds. Over the centuries, the fertility of the Indo-Gangetic plains was preserved through treating the soil as a living system, with soil-depleting crops being rotated with soil building legumes. Twenty years of "Farmers' Training and Education Schemes", however, have transformed the Punjab fanner into an efficient, if unwilling, "soil bandit". The result of such agricultural intensification has been "a downward spiraling of agricultural land use - from legume to wheat to wasteland. "6 The removal of legumes from cropping patterns, for example, has removed a major source of free nitrogen from the soil. In addition, the new HYVs reduce the supply of fodder and organic fertilizer available to farmers. Traditional varieties of sorghum yield six pounds of straw per acre for every pound of grain. By contrast modern rice varieties produce equivalent amounts of grain and straw. This has contributed to the thirty-fold rise in fertilizer consumption in the state since the inception of the Green Revolution. Increased fertilizer use, however, has not compensated for the over-use of the soil. High-yielding varieties rapidly deplete micronutrients from soils and chemical fertilizers (unlike organic manures which contain a wide range of trace elements) cannot compensate for the loss. Micronutrient deficiencies of zinc, iron, copper, manganese, magnesium, molybdenum and boron are thus common. In recent surveys, over half of the 8706 soil samples from the Punjab exhibited zinc deficiency, reducing yields of rice, wheat and maize by up to 3.9 tonnes per hectare. Partly as a result of soil deficiencies, the productivity of wheat and rice has declined in many districts in the Punjab, in spite of increasing levels of fertilizer application. One result of the Green Revolution has therefore been to create conflicts over diminishing water resources. Where crops are dependent on groundwater for irrigation, the water table is declining at an estimated rate of one-third to half a metre per year. A recent survey by the Punjab Directorate of Water Resources, has shown that 60 out of the 118 development blocks in the state cannot sustain any further increase in the number of tube wells. Although the Green Revolution brought initial financial rewards to many farmers, especially the more prosperous ones, those rewards were closely linked to high subsidies and price support. Such subsidies could not be continued indefinitely and farmers in the Punjab are now facing increasing indebtedness. Indeed, there is evidence of a decline in farmers' real income per hectare from 1978-79 onwards. The prime beneficiaries have been larger farmers and agrochemical companies. As peasants have become more and more dependent on "off-farm" inputs, so they have become increasingly dependent on those companies that control the inputs. HYV seeds are illustrative. Unlike the traditional high yielding varieties which have co-evolved with local ecosystems, the Green Revolution HYVs have to be replaced frequently. After three to five years' life in the field, they become susceptible to diseases and pests. Obsolescence replaces sustainability. And the peasant becomes dependent on the seed merchants (see Box). The further commercialization of seeds has been actively encouraged by the World Bank, despite widespread resistance from farmers who prefer to retain and exchange seeds among themselves, outside the market framework. Since 1969, the World Bank has made four loans to the National Seeds Project. The fourth loan—disbursed in 1988—was specifically intended to encourage the involvement of the private sector, including multinational corporations, in seed production. Such involvement was considered necessary because "sustained demand for seeds did not expand as expected, constraining the development of the fledgling industry." Intensive irrigation has led to the need for large-scale storage systems, centralizing control over water supplies and leading to both local and inter-state water conflicts. Despite a succession of water-sharing agreements between the Punjab, Rajasthan and Haryana, there is increasing conflict over both the availability of water and its quality. In the Punjab, farmers are actively campaigning to halt the construction of the Sutles-Yamuna Link Canal, which will take water to Haryana to irrigate 300,000 hectares for Green Revolution agriculture, whilst in Haryana, local politicians are lobbying hard for its completion. In 1986, irate farmers in the Ropar district of the Punjab, where the Link Canal begins, virtually forced the Irrigation Department to abandon work on the project. In May 1988, 30 labourers were killed at one of the construction sites. "For the past three years, we have increasingly lost money from sowing all our acreage with wheat. We have been held hostage to feed the rest of India. We are determined that this will change." There are two options available for getting out of the crisis of food production in the Punjab. One is to continue down the road of further intensification; the other is to make food production economically and ecologically viable again, by reducing input costs. Sadly, the Indian government appears to have adopted the former strategy, seeking to solve the problems of the first Green Revolution by launching a second. The strategy and rhetoric are the same; farmers are being encouraged to replace the "old technologies" of the first revolution with the new biotechnologies of the second; and to substitute wheat and rice grown for domestic consumption with fruit and vegetables for the export market. The production of staple foods is being virtually ignored. Like the first Green Revolution, the second is being promoted on the promise of "peace and prosperity". It is highly unlikely that the second revolution can succeed where the first failed. This article is extracted from The Violence of the Green Revolution: Ecological Degradation and Political Conflict in Punjab, a book published by Vandana Shiva, Debra Dun, 1989. Vandana Shiva is director of the Research Foundation for Science, Technology and Natural Resource Policy, 105 Rajpur Road, Debra Dun, 248001 India. Her latest book to be published in the West is Staying Alive: Women, Ecology and Development (Zed, London, 1989). Swaminathan, M.S., Science and the Conquest of Hunger, Concept, Delhi, 1983, p. 409. Bayliss-Smith, T.B. and Wanmali S., "The Green Revolution at Micro Scale", in Understanding Green Revolutions, Cambridge University Press, 1984. Dogra, B., Empty Stomachs and Packed Godowns, New Delhi, 1984. CGIAR, Integrative Report, Washington, DC, 1979. Kang, D. S., "Environmental Problems of the Green Revolution with a focus on Punjab, India" in Richard Barrett (ed. ), International Dimensions of the Environmental Crisis, Westview, Boulder, Colorado, 1982. Gill, S.S., "Contradiction of Punjab Model of Growth and Search for an Alternative", Economic and Political Weekly, 15 October, 1988. Christian Science Monitor, May 1984, p. 10. Read this article in Italian translation | Estonian translation | Georgian translation | Russian translation | Ukranian translation | Indonesian translation.